Girls for HIS Glory: Mother/Daughter T.E.A. - August 21st! 1) We will be walking through our Fall Girls Ministry Calendar and discussing all the fun details of our Girls Missions Retreat in late September! 2) Sarah Bragg, author of "Body. Beauty. Boys." will be speaking on Teachability, Encouragement, and Accountability, three areas that will help build stronger communication and a deeper relationship between mom and daughter. 3) We will have a super fun, hands-on activity that you won't want to miss! Plus lots of yummy snacks...it's a Tea Party! 4) This a great time for fellowship and community building not only with your daughter but with other moms and girls! So, like I said, you DON'T WANT TO MISS this afternoon tea with girls! This FREE event is for girls in 6th-12th grade and their Mom! 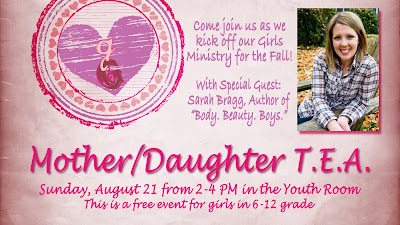 If mom is unable to attend, then I encourage girls to attend with Step-mom, Grandma, Aunt, or even with a friend and her mom! If you have any questions, feel free to email me at srowe@clevelandfbc.com. See you Sunday at 2!